This has to be our orchid with the smallest leaves. 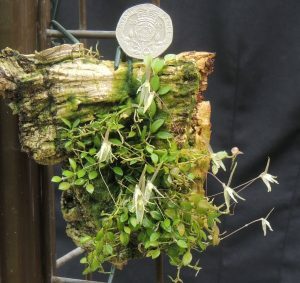 As can be seen from the 20p piece the leaves are a few mm long and produced on a creeping rhizome with relatively gigantic flowers produced in a mass in late summer. 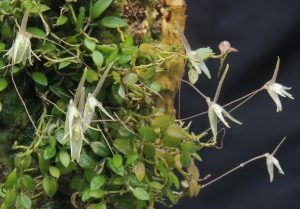 The species is native to Brazil where it is found in cloud forests at around 1000m.